Named an ALA Notable Book! To prepare for a backyard adventure, two children pack a rainbow of necessities: a blue backpack, a yellow book, even a multicolored blanket to serve as their tent when they take a nap. In uncomplicated sentences presented in both Spanish and English, the story is also illustrated in richly hued, swirling images." Take young readers on a backyard camping trip that will not soon be forgotten! 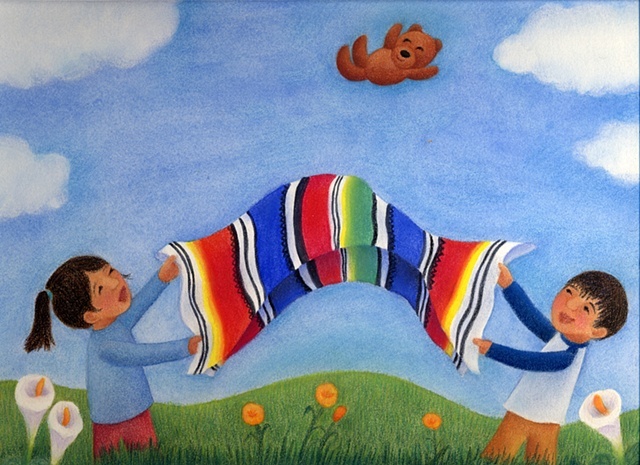 Written in English and Spanish, the story teaches a rainbow of color words and some common expressions. The rich and muted tones fill the pages with charm as two winsome children prepare to spend the afternoon outside in a tent...It is mighty comfortable in the shade of that backyard tent and soon enough, it is time for a little afternoon rest - siesta! Many studies show that children learn second languages best at young ages and this is a terrific tool to tempt kids to pick up some new words. Mi linterna negra. My black flashlight. Mi reloj blanco. My white clock.